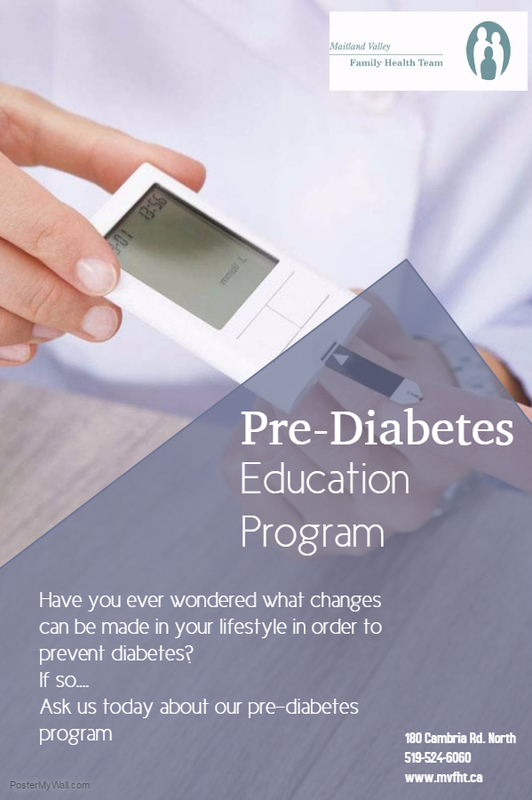 This program educates patients on behavior changes that can be made in order to prevent diabetes. Patients are referred by their primary care provider to our Pharmacist for their initial appointment. Pre-diabetes refers to blood glucose levesls that are higher than normal, but not yet high enough to be diagnosed with type 2 diabetes. Nearly 50 percent of those with pre-diabetes will go on to develop type 2 diabetes so it is important to get tested early and start making changes to your lifestyle. The risk for type 2 diabetes is higher as you grow older, the Canadian Diabetes Association recommends screening by testing fasting plasma glucose for everyone once they reach age 40 and every three years after that. If you have risk factors that increase the likelihood of developing type 2 diabetes, you should be tested more frequently or start screening earling. You may be able to reduce blood glucose (sugar) levels with simple lifestyle changes, such as increasing your physical activity and enjoying a healthy, low-fat meal plan.